RIO DE JANEIRO _ Powerful moments topped a political protest during the opening ceremony of the 2016 Paralympic Games, at least in the view of organizers, who saw the event as a big success. Andrei Fomachkin, who marched with the Belarus delegation, was a guest of the president of the Belarus Paralympic Committee. During the ceremony, he displayed the flag of Russia, which is banned from the games due to a state-sponsored doping program. Fomachkin’s accreditation has been removed. Despite the disruption, Craig Spence, a spokesman for the International Paralympic Committee, praised the ceremony and is optimistic that it emphasized a theme of inclusion. Spence said at a news conference Thursday that he now hopes the focus of the games will now turn toward the athletes. “There was so much nice messaging in there,” said Spence, singling out the torch relay, during which an inaccessible staircase suddenly transformed into a ramp leading to the Paralympic flame’s cauldron. 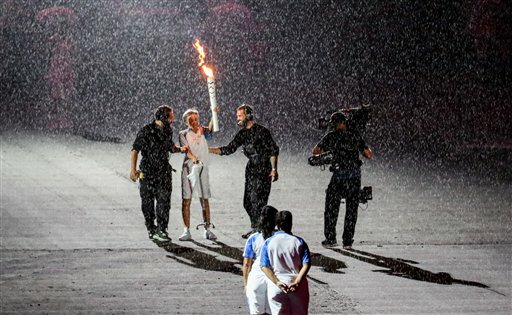 Probably the most powerful moment of the night came a few minutes earlier, during the torch relay, when a storm broke out and torch bearer Marcia Malsar, the first Brazilian to win gold at a Paralympic Games in 1984, fell to the ground in the rain. She then rose to a standing ovation and continued to carry the torch, with some help from assistants nearby. Even as disabled athletes from around the world congregate to compete in Rio, questions remain regarding the accessibility of the area. Spence said that it is impossible to “transform an entire city to an accessible metropolis” in the seven years between the country winning the bid and the games. However, Spence said hosting the Paralympics does have the ability to springboard a nation in the direction of increasing acceptance for disabled individuals — the same message Spence said was evident in last night’s ceremony. Emily Giambalvo is a journalism student at the University of Georgia. Penn State and Georgia are partnering with The Associated Press to supplement coverage of the 2016 Paralympics.